The term idiochromatic is used in referral to gem materials that derive their color from elements that are an essential part of their chemical composition. Their color is not due to impurities. A good example of an idiochromatic gemstone is almandine garnet which, when pure, is red. The coloring element is iron (Fe2+) which is an essential part of its chemical formula: iron aluminum silicate (Fe3Al2(SiO4)3). When the coloring elements aren’t an essential part of a gem material’s chemical build up we speak of allochromatic gemstones. 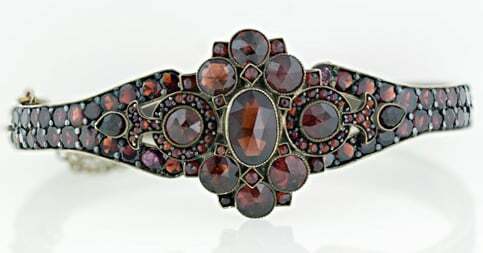 The Almandines in this Bracelet are Colored by the Absorption of Certain Wavelengths (Colors) by Iron Ions in the Gemstones. Since Iron is an Essential Ingredient of Almandine These Gemstones are Idiochromatic.